By William Mackay: The winner of the September 17th fight for the vacant WBC light welterweight crown between Erik Morales (51-7, 35 KO’s) and Argentinian Lucas Matthysse (28-2, 26 KO’s) is in a win-win situation where they not only will be capturing the vacant World Boxing Council title in the process of winning the fight, but they also will get the chance of fighting either WBO light welterweight champion Timothy Bradley or IBF/WBA light welterweight champion Amir Khan. In other words, they win no matter what. Khan wants the winner of the fight, because he’s interested in adding the WBC title to his other two light welterweight titles. However, Bradley can block Khan’s aspirations by taking the winner of the fight, because he’s the WBC Emeritus champion and is guaranteed a shot at the winner if he wants it. The question is whether he’ll be free and clear of his legal problems with his old promoter by then. If not, you can expect Bradley to choose not to take this fight and let Khan move in and attempt to capture the WBC title against the Matthysse-Morales winner. Since the fight is taking place in Las Vegas, there’s a lot less of a chance that we’ll be seeing a controversial decision than if the fight were to be taking place in the hometown of one of the two fighters. This is probably welcome news for Matthysse, because he’s lost two fights in the past year against hometown fighters that he arguably should have won in his losses to Zab Judah and Devon Alexander. Matthysse isn’t bitter from the defeats, and feels he’ll receive a fair shake from the Las Vegas judges. Morales has the better boxing skills compared to Matthysse, but he’s also older and not quite as busy or as powerful as Matthysse. This is going to be an issue if Matthysse is able to force Morales into a war, because if he’s not only landing more punches but the harder shots, it’s going to be difficult for Morales to win a decision. He lost his last fight against the busier and harder punching Marcos Maidana last April. 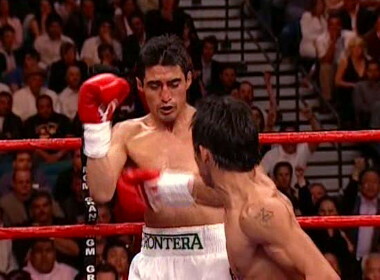 We could see the same thing happening again against a technically more skilled Matthysse.